The archive file is a type of Outlook Data File (.pst). The first time AutoArchive runs, the archive file is automatically created. Where the file is created depends on the operating system running on your computer. On the View tab, in the Advanced settings list, under Files and Folders, under Hidden files and folders, select Show hidden files, folders and drives. 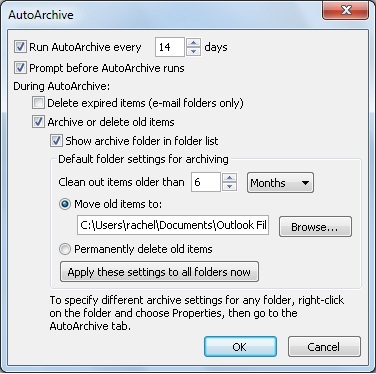 For more information about the AutoArchive feature, see Use AutoArchive to back up or delete items.